A day with a difference, where the NELPG's Q6 and J27 work came together, hence a combined report this week. A cool, grey, morning with a hint of rain, although it did clear up in the afternoon and there was even a touch of sun, when Ian Pearson, Jon Bradley, Bill Dobson, Steve Hyman, Alan Featonby (a member on a trip back home from Ontario, Canada) and myself gathered at Deviation Shed for the usual cup of tea. The plan was that Chris Cubitt and Charlie Woods would be taking the J27 up to Goathland on some light engine running in turns, and taking Steve and Alan with them. The rest of us would then continue working on the Q6. However, Chris Cubitt was unavailable in the morning, and because Charlie had lots of electrical work to complete, he was pleased to find Ian and Jon were available to drive and fire the J27. Charlie already had oiled up the engine and Ian and Jon then took over the reins, and after some last minute fitting work and lots of successful vacuum tests, the J27 was ready to move down to the station, after getting water, by1120 am, taking Steve Hyman and Alan Featonby with them (see photos - don't they look happy!). With Ian driving the first two trips and Jon on the shovel, checks were made at regular intervals on bearing temperatures and all was found to be OK. Then, later on Jon drove and Steve fired, then Steve had a go driving with Jon tutoring him while Ian fired, and lastly Alan drove up to Goathland home signal tutored by Jon. They were back on shed by 16.20 for disposal and with the fire dropped, the J27 was put back into the running shed on No 5 road and boiler filled. There were some problems with a sticking damper door at disposal, the ash pan sprays will need a little adjustment, and there is a list of other minor fettling jobs that were identified during running, but otherwise the locomotive was fine and ran very smoothly. 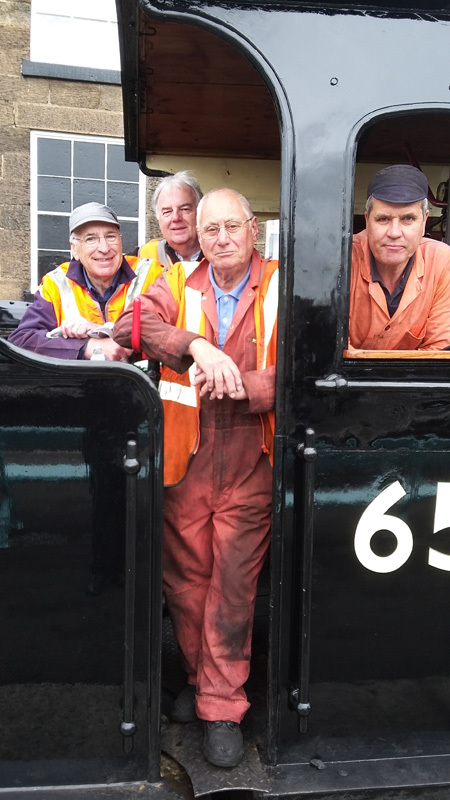 The same routine was to be followed today with Ian and Jon as crew, and, via the webcam, saw the J27 leave Grosmont light engine at 1100, with hopefully Neil Smedley and Les Harper on board, fitting in with available paths round the service trains. Assuming that concludes sucessfully, the next three days will see the J27 attached to the rear of service trains and getting in some mileage to Pickering, and, subject to no problems being identified, on Monday it will enter service on the Gresley teak set, which for operational reasons will be down to three coaches, as its regular daily turn. If anyone is out and about taking photographs of these events though, can I ask as Archivist, if any could be forwarded for me to go in the archive, as I will be away for the next week and will not be able to take any myself. I have also retrieved the J27 NER style dome from the boiler shop, and it is now on the floor just inside Deviation Shed by the gate next to No 5. While several members were driving, firing and generally enjoying the fruits of a marathon 12 year overhaul of the P3/J27, Bill in the morning, and assisted by me after lunch, and even later in the afternoon by Chris Cubitt, set about the hydraulic testing of the Q6 superheater header. Bill had already asked Shaun Bowler of the NYMR to make 4 blanking plates and associated clamps last Friday, and these were used, together with 24 rubber "doggie balls" kindly lent by William Parish of the Essex Locomotive Society, currently working on the S15 boiler in Deviation Shed. 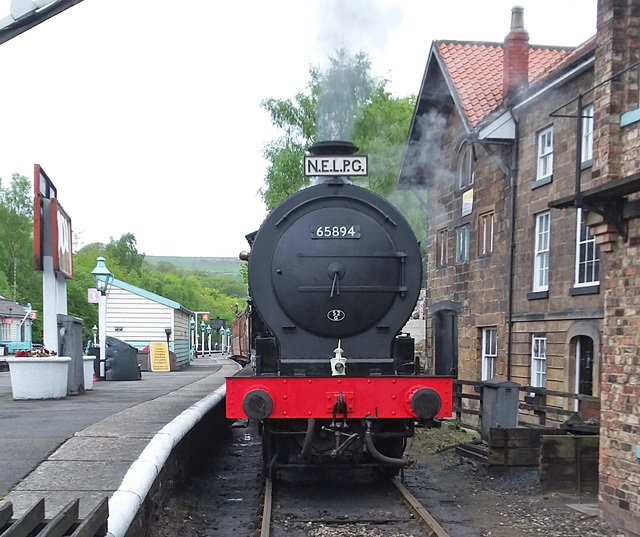 The superheated side of the header was tackled first, and, after a number of tightenings of the enormous number of bolts and associated places for the rubber seals to leak, eventually a test pressure of 270 psi was reached, to the satisfaction of the NYMR boilersmith, Mark O'Brien. The saturated side of the header is due to be tested on Saturday, so there will be a working party this Saturday after last week's late cancellation. There is also the stove chimney to finish off and get the flashing on the roof fixed before the stove itself dissolves in the rain - it is currently a very vivid orange colour! - never mind work to do on the Q6 itself.